Not to be confused with dormouse or Mouse (Alice's Adventures in Wonderland). The Hatter with the Dormouse asleep on the left. Illustration by John Tenniel. 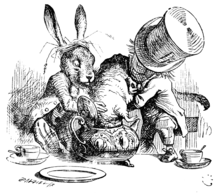 The Dormouse is a character in "A Mad Tea-Party", Chapter VII  from Alice's Adventures in Wonderland by Lewis Carroll. The Dormouse sat between the March Hare and the Mad Hatter. They were using him, while he slept, as a cushion when Alice arrives at the start of the chapter. He also tells a story about three young girls who live in a treacle well, live on treacle, and draw pictures of things beginning with M, such as mousetraps, memory and muchness. He later appears, equally sleepy, at the Knave of Hearts' trial and voices resentment at Alice for growing, and his last interaction with any character is his being "suppressed" (amongst other things) by the Queen for shouting out that tarts are made of treacle. The character also appears in Disney's Alice in Wonderland. As in the book, he is sleepy and lazy, but unlike in the book, he sings Twinkle, Twinkle, Little Bat instead of telling his story about mouse sisters to entertain the tea-party participants. He panics at the mention of the word "cat", much like The Mouse from the book, and needs to have jam spread on his nose in order to calm down. This first happens when Alice talks about her cat Dinah, causing the March Hare and the Mad Hatter to chase after it in order to administer the jam. The Dormouse later appears as the second witness at Alice's trial, where two playing cards had to have the Queen of Hearts question it quietly. When Alice points out that the Cheshire Cat is on the Queen of Hearts' crown, the Queen of Hearts quotes "cat", causing the Dormouse to panic, with the March Hare, the Mad Hatter, and the King of Hearts running around trying to catch him, with comical results. The Disney version of the character also appears in House of Mouse and Mickey's Magical Christmas: Snowed in at the House of Mouse. In Tim Burton's 2010 Alice in Wonderland film, the Dormouse is named Mallymkun. Unlike the sleepy character in the book, this Dormouse is an action-oriented swordswoman similar to the character Reepicheep from The Chronicles of Narnia. She is voiced by Barbara Windsor. She is initially seen with the group Alice first meets in Wonderland, and saving Alice from the Bandersnatch by plucking out its eye. She is seen a second time at Thackery Earwicket, the March Hare's tea party having tea with the March Hare and the Mad Hatter. The Dormouse is played by Arte Johnson in the 1985 television film Alice in Wonderland. When he initially shows lack of movement at the mad tea party, Alice mistakes him for a stuffed animal. The Dormouse then quickly objects to Alice's statements. The Dormouse appears in the live-action TV series Adventures in Wonderland, and is voiced by John Lovelady. He isn't sleepy, and is often seen popping out of his tea pot or other things. In one episode, he is the announcer of a sprinting event. The Dormouse appears in Dreamchild performed by Karen Prell and voiced by Julie Walters. Pandora Hearts in the anime and manga series Dormouse is a chain that puts people to sleep and Vincent Nightray is its contractor. The Dormouse makes an appearance in the video game American McGee's Alice, where he and the March Hare are held captive as the Mad Hatter's experimental subjects. He is tied to a dissection table and continues to fall asleep from the Hatter's medicines. The Dormouse appears again in the 2011 sequel Alice: Madness Returns, where he and the March Hare capture a part of the Mad Hatter as revenge for the events in American McGee's Alice. Black Butler, in the OVA Ciel in Wonderland, Ronald Knox is the dormouse. 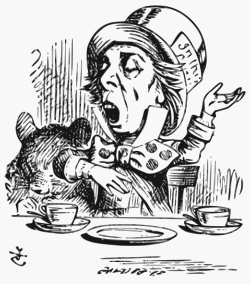 In the SyFy TV Miniseries Alice, the Dormouse is a sidekick of the Hatter. Mallymkun the Dormouse appears as a playable character in the video game adaptation of Tim Burton's Alice in Wonderland. The Dormouse appeared in the Sunsoft's 2006 mobile game Alice's Warped Wonderland (歪みの国のアリス, Yugami no kuni no Arisu, Alice in Distortion World). While prone to falling to sleep, Dormouse tries to be helpful to Ariko (the "Alice of game) and treats her gently. In one of the bad endings, Dormouse gets killed by a twisted Cheshire Cat. The Dormouse appears as a member of the Mad T Party band at Disneyland's California Adventure Park. In the Mad T Party he is interpreted as a male rather than the 2010 film's female Mallymkun, who he is based on. He plays lead guitar and often scurries around with the March Hare on stage. The Dormouse was portrayed by Dudley Moore in the 1972 British musical film Alice's Adventures in Wonderland. The Dormouse was referenced in the fantasy series Once Upon a Time in Wonderland, a spin-off of Once Upon a Time. In the pilot episode, the White Rabbit mislead Alice and the Knave of Hearts in saying that, while having tea with the Dormouse, he learned that Alice's true love Cyrus was alive. In reality, he received this information from the Red Queen. 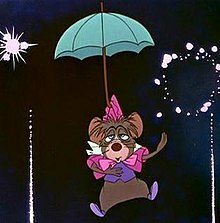 The Dormouse is referenced in popular culture by two American rock bands: Firstly by Jefferson Airplane in the song "White Rabbit", in which the last line of the song, repeated twice and building through a crescendo is "Remember what the dormouse said: feed your head, feed your head". From this lyric, John Markoff derived the title of his 2005 book, What the Dormouse Said: How the 60s Counterculture Shaped the Personal Computer Industry. Secondly by the progressive metal band Queensrÿche in the song "Right Side of My Mind": "Re-engineer your head is really what the dormouse said". The vocal part of the original song by Jefferson Airplane has also been used in German Techno DJ Paul Kalkbrenner's "Feed Your Head". ^ Boucher, Geoff (February 14, 2010). "Tim Burton says Alice has "a national treasure" in Barbara Windsor". Los Angeles Times. Tribune Company. Archived from the original on November 15, 2010. Retrieved February 21, 2010. ^ "Alice's Warped Wonderland". Sunsoft. Retrieved August 26, 2018. ^ "Alice's Warped Wonderland ~Encore~". Sunsoft. Retrieved August 26, 2018. ^ "Entertainment - Disneyland Resort". go.com. ^ Markoff, John (2005). What the Dormouse Said. New York: Viking. p. vii. This page was last edited on 23 March 2019, at 07:47 (UTC).